Pozo Izquierdo: This spot, which is situated in the municipal area of Santa Lucía, is internationally famous on account of the ideal windsurfing conditions, the wind being ever present. In "El Arenal" (the name by which this beach is known to the local inhabitants), the wind usually blows from the left, tending to be very strong, with the result that you must use 2.8 and 4 metre sails if you want to fully enjoy this spot, which is one of the most windy places in the world. The waves are generally no less than one metre high and they can reach heights of up to 3 metres. Pozo is the ideal destination for those who have an acceptable level of skill in planing and jibing and who want to start on jumps and other aerial acrobatics. 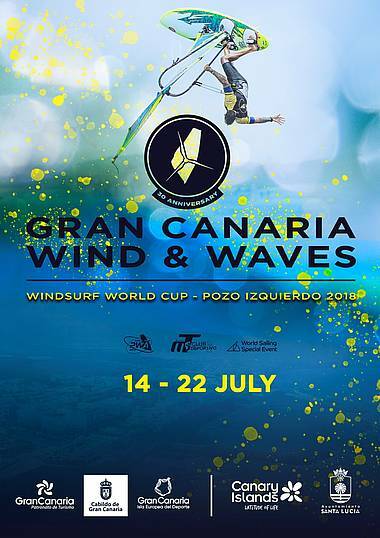 - Youth's Results 2018 Gran Canaria Wind & Waves Festival available here.